We are using our 11X14 Palette/Panel Holder for this tutorial. Please note that there is only 1 aluminum side arm on the 8X10 and 10X12 sizes. Also, there is NOT a "stiffener" (where the tripod fitting is located) on our 8X10 and 10X12 sizes. On the smaller sizes, the tripod fitting is recessed into the rear back portion on the underside of the Palette/Panel Holder. Loosen the thumb nuts and the wing nuts that are located on the sliding arm assembly on the side of the Palette/Panel Holder. Don't forget about the thumb nut(s) on the underside of the Palette. Now, open the "lid" of the Palette/Panel Holder to about 90 degrees. Next, slide the aluminum side arm(s) ALL OF THE WAY BACK to achieve the maximum stability. Tighten the wing nuts and thumb nuts snugly to the desired angle. You should never have to use pliers. PA QUICK RELEASE PLATE is quite handy for attaching your Palette/Panel Holder to a regular 35mm camera tripod. The plate screws into the threaded fitting on the underside of the palette and allows the Palette/Panel Holder to then be clipped into the ball head of a tripod. Please note that QUICK RELEASE PLATES vary depending on what brand of tripod is being used. If you are unsure about a 'Quick Release Plate' option for a specific tripod, we advise contacting the supplier of the tripod that is being used. Attach the Palette/Panel Holder to the ball head of the tripod. Loosen the two wing nuts on the back of the panel holder. This will allow you to slide the arms that will be holding your panel. Adjust the arms so that they are about 1/4" LESS THAN the horizontal size of the panel. Tighten the wing nuts in place on the backside. Now, slide the panel into the LEFT spring arm and allow our PATENTED SPRING ARM SYSTEM to hold your panel in place. There aren't any protrusions that interfere with brush strokes and there is not any vertical limitation to the panel height. The Side Palette Extension can be easily removed from the bronze spring clip on the Palette/Panel Holder and attached to either the left or right side of the palette. To attach the extension, simply loosen the thumb nuts that are on the underside of the palette, line up the grooves on the palette extension with the screws that are associated with the thumb nuts, then tighten the thumb nuts to hold the extension in place. 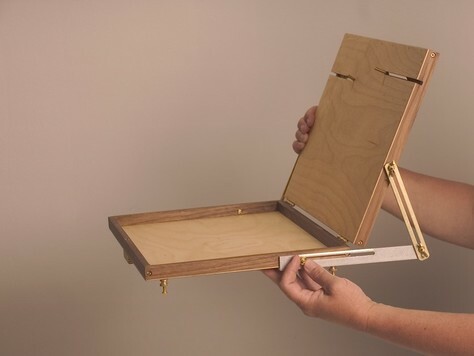 This is a picture of the 11x14 Palette/Panel Holder with a side palette extension (included with the purchase of any Palette/Panel Holder), a Brass Tray, a Brass Hook that is suspending a Holbein turpentine container, a Holbein medium cup, a Manfrotto tripod and a tripod apron. After a painting outing and before closing your palette, scrape off excess paint in the mixing area with a palette knife or flat razor blade (going left to right, with the grain of the wood) and then wipe it down with turpentine or other brush washing solvent. Paint will begin to absorb into the grain of the wood and eventually a nice patina will build up on your palette area. The most important thing to remember is to not allow excess paint to dry in the palette mixing area. Some artists have a piece of glass cut that will take up the inside of the palette area. If you choose to do this, a dab of silicone in each corner will be sufficient in holding the glass down. Some artists feel it necessary to add a more protective substance to the palette area prior to first use. If you do this, we recommend that you use an oil based substance. First, lightly sand the palette area before applying the substance and then follow the directions for applying whatever substance is being used. Below is a short tutorial of Chicago based artist and instructor Errol Jacobson setting up the Open Box M 10 X 12 Palette/Panel Holder. The Palette and Chisel Academy of Fine Arts at paletteandchisel.org.